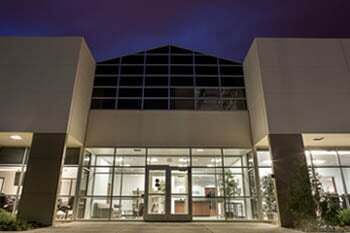 Snap Dome Arrays - Shop Our Standard Options | Snaptron, Inc. 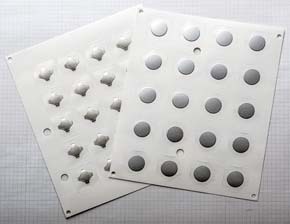 Individual Standard Peel-N-Place™ domes are attached to a square of pressure-sensitive adhesive tape. Each individual snap dome is peeled off the release liner backing and will adhere securely to a circuit board, flex circuit, or membrane. You can specify many of our F-Series, U-Series, P-Series, or M-Series domes in standard Peel-N-Place (PNP). For other dome styles in Standard PNP format, please contact us today. Our Standard Peel-N-Place™ (Four-Leg) dome arrays were designed specifically for mounting on printed circuit boards, flex circuits, and membranes. They are individual domes backed with a square of polyester adhesive. Each individual tactile dome is then peeled off the release liner and placed onto a circuit board, flex circuit, or membrane, with the polyester adhesive serving to hold the dome in place. You can specify the standard four-legged Snaptron dome that best suits your needs. Our application specialists can help you with your specific requirements. Two 4-leg domes can also be STACKED in a single position to achieve double actuation force. Our Standard Peel-N-Place™ dome arrays are manufactured entirely in Windsor, Colorado, to our exacting specifications to ensure that you always receive the highest quality product with consistent characteristics every time you order. Our Standard Peel-N-Place™ (Round) dome arrays were designed specifically for mounting on double-sided printed circuit boards and membranes. They are individual snap domes backed with a square of polyester adhesive. Each individual dome is then peeled off the release liner and placed onto a circuit board, flex circuit, or membrane, with the polyester adhesive serving to hold the dome in place. You can specify the standard round Snaptron dome that best suits your needs. Our application specialists can help you with your specific requirements. Our Standard Peel-N-Place™ (Round) dome arrays are manufactured entirely in Windsor, Colorado, to exacting specifications to ensure that you always receive the highest quality product with consistent characteristics every time you order. 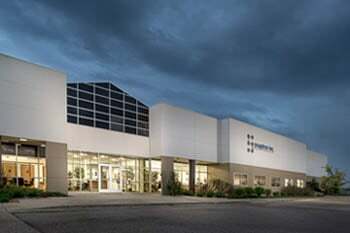 Snaptron, Inc. was founded in 1990 specifically to serve the membrane switch and related switch industries, filling a void previously unsatisfied by other tactile metal dome suppliers. Since our inception, we have expanded to serve many different industries throughout the world. Our mission is to aggressively pursue innovative solutions to our customers’ needs. This includes providing a wide variety of high-quality, low-profile, surface-mount snap dome switches and related products. In addition to manufacturing the highest quality products, we provide the service and expertise customers need to be successful. Many of our products are custom designed to satisfy specific needs. Our team has a combined experience of more than 100 years in the snap dome industry. We manufacture all of our domes in Windsor, Colorado to our precise specifications. You’ll receive only the highest quality product with consistent characteristics every time you order. Have questions? Read our FAQ page.